Odisha: Bhubaneswar Cycling and Adventure Club organizing its Annual Flagship Cycling Adventure from Manali to Leh and KhardungLaBhubaneswar: It a matter of great pleasure informing you that Bhubaneswar Cycling and Adventure Club (BCAC) is organizing its Annual Flagship Cycling Adventure from Manali to Leh and KhardungLa in 2018. Leh-Manali Highway is known as one of the most challenging terrains and one of the highest motorable roads of the world. The terrain, the climatic conditions and the thinness of the air at high altitude makes cycling in this stretch even trickier. The cycling expedition will start on Thursday, 2nd of August from Manali and will end on 12th of August 2018 ascending to an elevation of more than 18000 feet within a span of 11 days. A total of 13 riders will ride on their bicycles, who will be accompanied by a number of riders from all over India at Manali. The ride will start from Manali, will go through Marrhi, Sissu, Jispa, Zhing-Zhing Bar, Sarchu, Pang, Debring, Rumtse, and reach Leh and the ride will end at Khardung La. 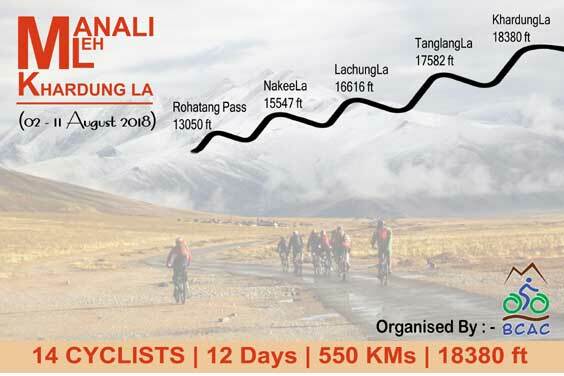 On the way, the cyclists will pass through many passes of Leh-Manali Highway, through Rohtang Pass (13050ft), Nakee La (15547ft), Lachung La (16616ft), Tanglang La (17582ft), Khardung La (18380ft). BCAC as the most recognized Cycling Club of Bhubaneswar, has been credited with many adventures nationally and internationally. In 2015 six (6) riders from BCAC have pedalled 1102Kms from Bhubaneswar to Bhutan, in 2016 seven (7) riders have conquered 2002Kms from Vietnam to Cambodia, in 2017 eight (8) riders have travelled all the way to Kathmandu (Nepal) from Cuttack (the Silver City). Apart from these international rides, BCAC has also conducted many inter-state and intra-state rides for different causes on different occasions. As a socially responsible cycling and adventure club, BCAC has conducted many sensitization rides, cycling explorations and heritage rides to promote culture while spreading environmental awareness. This year in 2018, BCAC is going to challenge yet another adventure with cycling in high terrains of the Mighty Himalayas.